The Power of the Collective: The SK PCAP Partners believe that more can be accomplished by acting together than by acting alone. The SK PCAP Partnership brings diverse groups together to speak with one voice and to work together under a common vision for prairie conservation. Partnerships: Partners believe that it is both possible and desirable for groups with diverse interests and needs to find mutually agreeable solutions to the challenges of prairie conservation. Participants respect and seek to understand the views and interests of all of the Partners. Sustainable Use of Prairie: The SK PCAP Partners see prairie as a working landscape that can include people and their livelihoods as a positive part of the ecosystem. 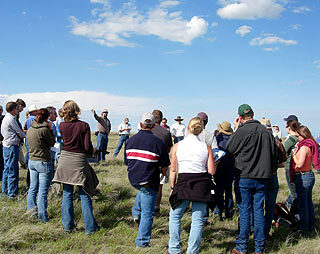 We view sustainable uses of prairie as fundamental to its conservation. The Intrinsic Value of Prairie: The SK PCAP Partners recognize that prairie ecosystems provide many benefits to humans. Partners also recognize that prairie ecosystems and the species found within them have intrinsic value, beyond any human use. Engaging People: People who understand prairie learn to value prairie, and people who value prairie will work to conserve it. The SK PCAP Partners engage Saskatchewan people in learning about and experiencing the prairie as a means to promote conservation. An Integrated Approach: Partners approach prairie conservation in a way that considers and integrates the ecological, socio-cultural, and economic interests related to native prairie conservation issues. Adaptability: In the quest to reach prairie conservation objectives, the SK PCAP Partners seek and adapt to new knowledge with enthusiasm and creativity. Commitment to Action: The SK PCAP Partnership is an action-orientated organization. Partners set out clear implementation plans and commit to achieving measurable results that contribute to the goals of the Partnership.